On the dawn of the launch of their second release, this time in support of people affected by the Syrian crisis, we talk to political streetwear collective HYPEPEACE, whose first release, the super popular "Palestine" sweater - a clever play on the famed "Palace" tri-ferg, with proceeds going to Palestinian youth forum Sharek - shot them straight to Insta-fame and beyond. 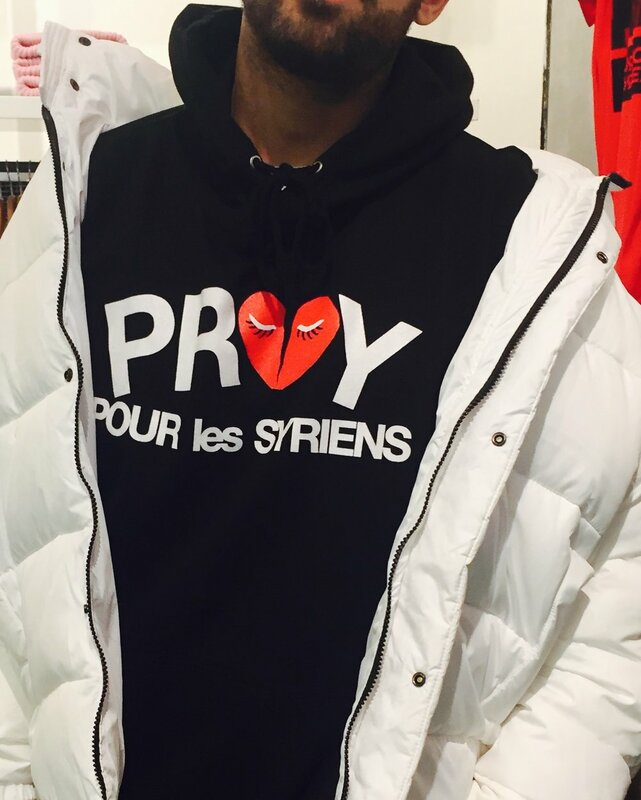 KNOTORYUS: Let's talk about the aftermath of the first HYPEPEACE release, the "Palestine" designs. Did you expect it to take off so quickly? 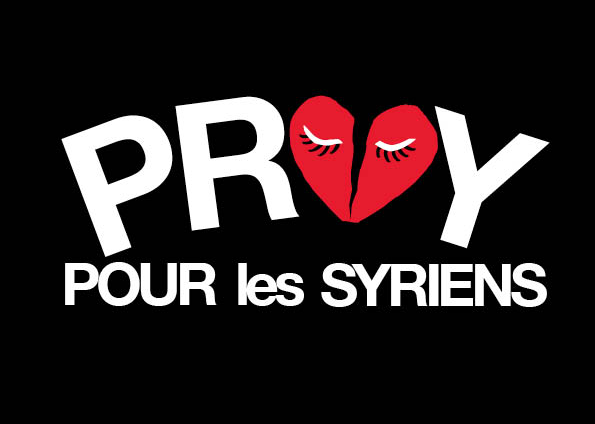 KNOTORYUS: How did the new ‘PRAY POUR les SYRIENS’-range come about? KNOTORYUS: Sure sounds like it. HYPEPEACE: “After that, things will calm down a bit and then in March we’re going to prepare our pop-up tour because we’d like to travel around Europe and open pop-up shops all over the place during the summer. That way people can get their products immediately. Some people had to wait up to three weeks for their deliveries, in countries like Australia or the U.S. it was even worse to get shipments over there on time. We just want people to be able to take their buys home immediately. We want to grow a collaborative movement. We try to be politically involved by attending rallies and supporting events for the causes we believe in, we're not just involved in the creative side. KNOTORYUS: Do you guys still prefer to operate anonymously? HYPEPEACE: “The message of HYPEPEACE is what's important here and none of us are particularly fond of being in the spotlight. We've also received a couple of death treats after the 'Palestine' release. It's just nice to operate anonymously in this culture of everybody broadcasting themselves and having a 'personal brand'. We think the causes we support speak for themselves." KNOTORYUS: It's also extremely cool that you have found a way to protest and resist that actually pushes things forward: people are receiving help from the causes you support, you raise awareness, your clients raise awareness by wearing the garments. Wearing your clothes is a form of activism in itself. I often find myself thinking: “How can I resist and protest more? Should I yell more on my Facebook page or get out on the streets more often?” And then my partner pointed out to me that our office is the most diverse and intersecting place, that the way we hire staff or choose interns is a way of battling the system inside-out. A lot of boardrooms we step into, I'm the only black woman with a real seat at the table. He feels that I am already doing a lot by just being there and being heard. We also always make sure to show our clients how diverse their audience is, so it is not going to do them any favours showing only straight white people in your communication. KNOTORYUS: Exactly. You mentioned pop-up shops before, what’s your vision for the retail aspect of HYPEPEACE, will you be stocked in established stores too? I can see the brand displayed alongside Palace or Comme Des Garçons Play at Dover Street Market for instance. It would make a lot more sense than seeing Ballin’ next to Balmain, for instance. KNOTORYUS: Finally, which endorsement have you enjoyed the most so far? And who would you like to see wearing HYPEPEACE? KNOTORYUS: You've got to try! KNOTORYUS: Omg yes please. Well, good luck, it's an amazing thing that you are doing and thanks for talking to us.